Huawei has been bringing some amazing iterations to the market and Honor View 10 is no different. The features are quite similar to that of Huawei Mate 10, but the design is significantly diverse. It looks and feels much better when held in hand. The dual cameras bump on the back do look a bit out of place, but the results are fantastic. Furthermore, the performance is top notch, which is expected of a high-end smartphone. You can multitask quite easily without worrying about slowdowns or any other complications. The bigger screen allows for better resolution, and that makes everything on Huawei Honor View 10 look incredible. If you have been holding out for a bigger screen smartphone that actually functions well, then you should definitely look into View 10. The matte design finishing is great. Huawei has always brought some awesomely designed smartphones to the market, and View 10 is another brilliant example of that. Despite being huge in size, the phone feels incredibly easy to hold due to finesse finishing. It comes in two colors as of now and both of them are great. One of them is traditional blue color that you find in most Huawei brands, and the other is black. It’s not jet black as most of the smartphones these days as it falls more in the category of grayish-black. It still looks awesome though so it is definitely job well done. Huawei Honor View 10 is equipped with Hisilicon Kirin 970 chipset, Octa-core (4×2.4 GHz Cortex-A73 & 4×1.8 GHz Cortex-A53) CPU, and Mali-G72 MP12 GPU. These high-end specifications allow you to multitask easily. Those of you interested in mobile games would also find it to your liking. The bigger screen makes the visuals look good, and due to amazing specifications, everything runs smoothly as well. Honor View 10 comes with dual cameras. One is of 16MP while the other is of 20MP. They both complement each other really well. The results are stellar as you can take sharp photos at any time of day. Usually, the flash ruins the pictures in some instances. However, that’s not the case here as flash is implemented well. Those of you who prefer a phone with a great camera will feel right at home with Honor View 10’s offering. The secondary camera is of 13MP and is equally amazing. Selfie fans would absolutely love it due to its sharpness and the ability to provide great results. 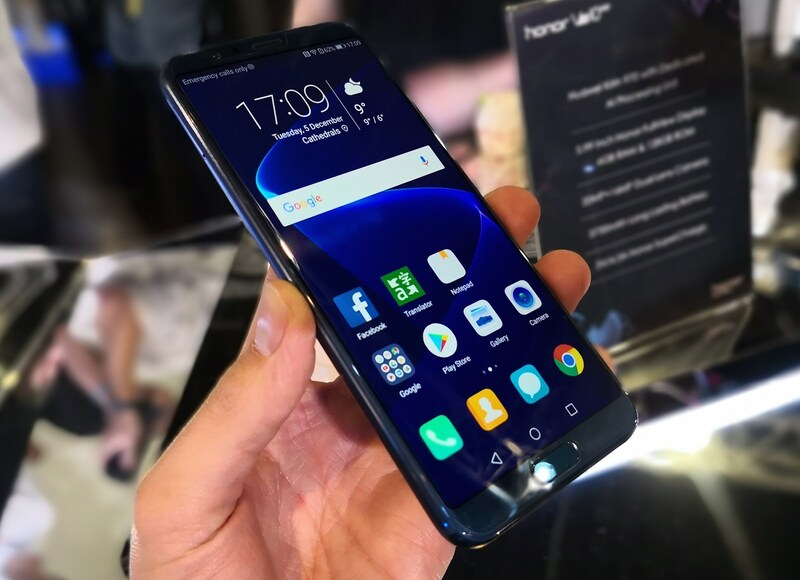 There are two different versions of Huawei Honor View 10 available in terms of storage space. One comes with 64GB of storage and is obviously cheaper, whereas the other version boasts 128GB of storage space. Even if you run out, you can extend this space via microSD cards which are supported up to 256GB. The battery has 3750mAh capacity and it can last you for quite a while. To make things even better, EMUI’s battery modes have been added which allow you to choose from different battery modes for your device. The device lasts easily for a day, but using different battery modes, you can make it last for longer periods of time.